On the 11th (Tue), delve into the distant past at Colosseum, stop by Officine Creative Roma, then take in the architecture and atmosphere at St. Peter's Basilica, and finally get to know the fascinating history of Piazza Navona. Here are some ideas for day two: delve into the distant past at Palatine Hill, ponder the design of Trevi Fountain, then shop like a local with Via Condotti, and finally admire the landmark architecture of Pantheon. For more things to do, ratings, where to stay, and other tourist information, you can read our Rome trip itinerary builder. Singapore, Singapore to Rome is an approximately 16.5-hour flight. The time zone difference moving from Singapore Time (SGT) to Central European Time (CET) is minus 7 hours. Traveling from Singapore in July, Rome is slightly colder at night with lows of 24°C. Finish your sightseeing early on the 13th (Thu) to allow enough time to take a train to Florence. On the 13th (Thu), make a trip to Piazza della Signoria, see the interesting displays at Uffizi Gallery, and then take in the views from Ponte Vecchio. Here are some ideas for day two: examine the collection at Galleria dell'Accademia, pause for some serene contemplation at Cathedral of Santa Maria del Fiore, then stop by Pegna dal 1860, then don't miss a visit to Mercato Centrale, and finally get great views at Piazzale Michelangelo. For more things to do, maps, where to stay, and tourist information, read our Florence itinerary maker. You can take a train from Rome to Florence in 2 hours. Other options are to drive; or do a combination of train and flight. Plan for slightly colder nights when traveling from Rome in July since evenings lows in Florence dip to 21°C. Wrap up your sightseeing on the 15th (Sat) to allow time to take a train to Venice. Start off your visit on the 15th (Sat): stop by Artigianato d'Arte di Vianello Mauro, take in the views from Ponte di Rialto, then explore the activities along Canal Grande, and finally look for gifts at Raggio Veneziano. Keep things going the next day: don't miss a visit to St. Mark's Square, then admire the landmark architecture of Basilica di San Marco, and then browse the exhibits of Doges' Palace. For reviews, photos, other places to visit, and tourist information, use the Venice trip generator. Traveling by train from Florence to Venice takes 2.5 hours. Alternatively, you can drive; or fly. While traveling from Florence, expect little chillier days and about the same nights in Venice, ranging from highs of 33°C to lows of 23°C. 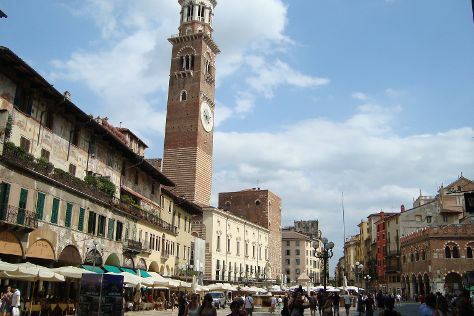 Finish your sightseeing early on the 17th (Mon) to allow enough time to take a train to Verona. On the 17th (Mon), delve into the distant past at Arena di Verona, then take a stroll through Piazza delle Erbe, then look for gifts at Cioccolateria Via Conventino, and finally enjoy some music at Castelvecchio Museum. To see other places to visit, photos, ratings, and other tourist information, go to the Verona travel itinerary creator. Getting from Venice to Verona by train takes about 1.5 hours. Other options: drive; or take a bus. Expect a daytime high around 35°C in July, and nighttime lows around 22°C. Finish up your sightseeing early on the 17th (Mon) so you can go by car to Como. Start off your visit on the 18th (Tue): take in the spiritual surroundings of Duomo di Milano, then admire the striking features of Galleria Vittorio Emanuele II, and then stop by dep design store. On the next day, stop by L'Isola Che Non C'e', look for gifts at Olivetum, then look for gifts at Tea World, and finally choose your vessel at Turati Centro Nautico Lario. For photos, maps, and other tourist information, use the Como vacation planner. Traveling by car from Verona to Como takes 2 hours. Alternatively, you can take a train; or take a bus. Wrap up your sightseeing on the 19th (Wed) early enough to travel back home.